Heavy-duty equipment, houses, home appliances, motorbikes, and different kinds of vehicles are just some of the things that we need to buy some time in our lives. They could be for personal use or for business. Now, to make sure that you will be able to make the most out of these things and so that they last for a long time, it should be taken cared of and maintained. Maintenance is related to a lot of things and that includes, safety, quality, and inspection to name a few. This just shows how important maintenance is. We will be discussing about maintenance, what it is, why it is important and other things that you will find helpful about maintenance. 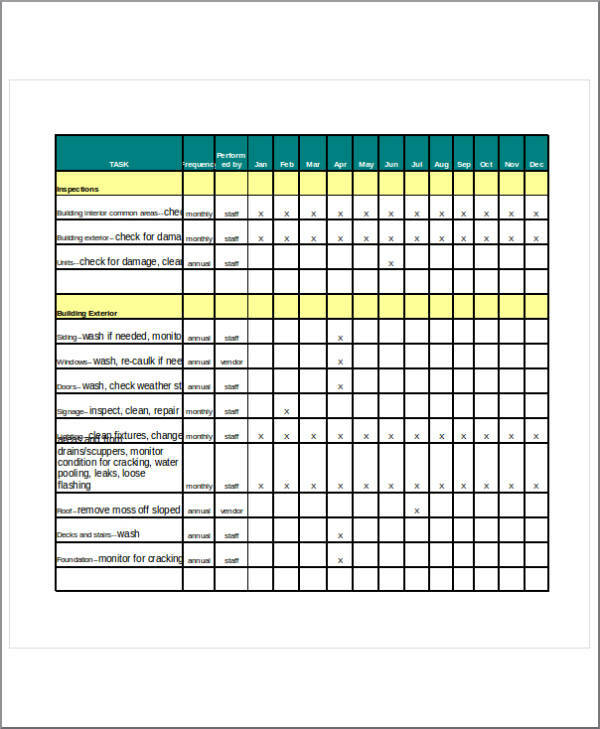 Included in this article to better your understanding of the topic are 15 simple and easy to understand maintenance checklist template samples. 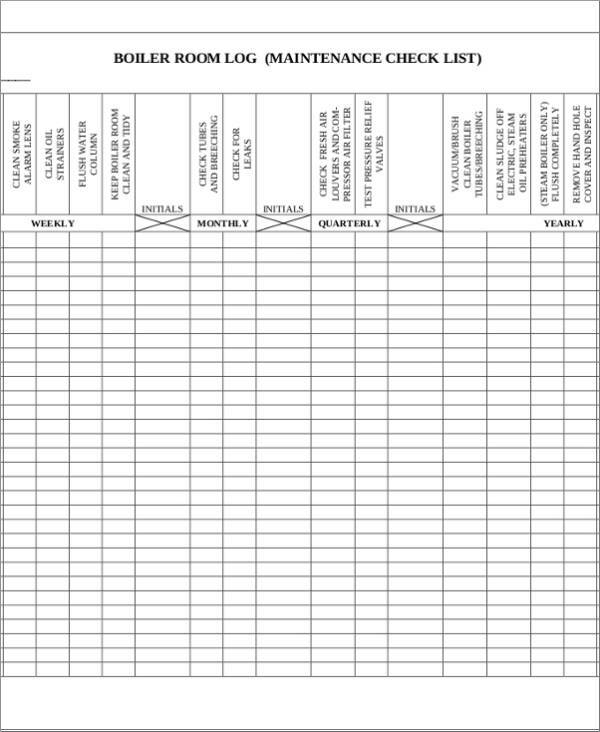 These samples are available in PDF, Word, and Excel to make it easy and convenient for you to edit and download them. Check them out below. 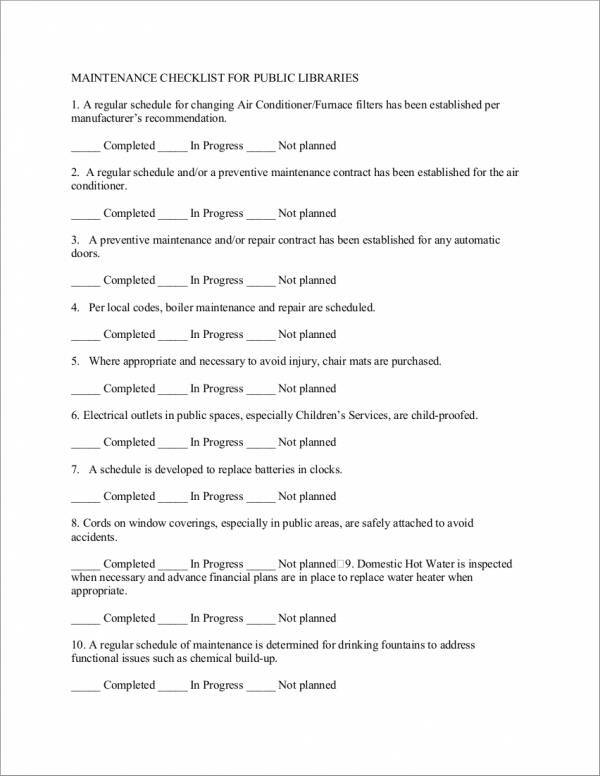 What Is a Preventive Maintenance Checklist? Machines and equipment, no matter how big, are never immune to damages and malfunctions. They are in fact prone to damages or they may not function at all. Scheduling and performing maintenance on these things on a regular basis can help prevent damages and malfunctions on machines and equipment. 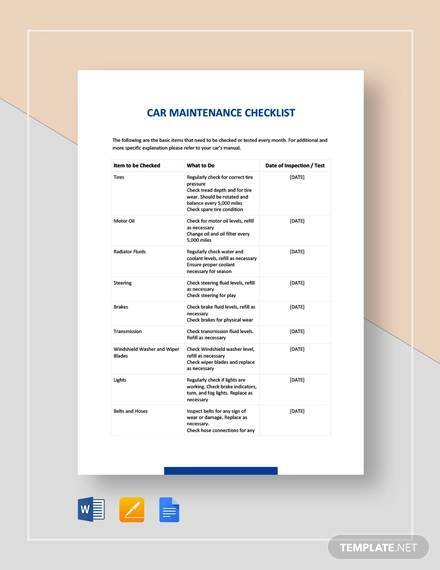 This type of maintenance is called a preventive maintenance and it makes use of a preventive maintenance checklist as a guide to ensure that all preventive maintenance tasks are covered. There are a lot of tasks involved in this type of maintenance and that includes doing inspections, tests, repairs, replacements to name a few. minimize the possibility of damage or breakdown on any machine or equipment and makes sure that any problems get corrected before it can even make any damages. 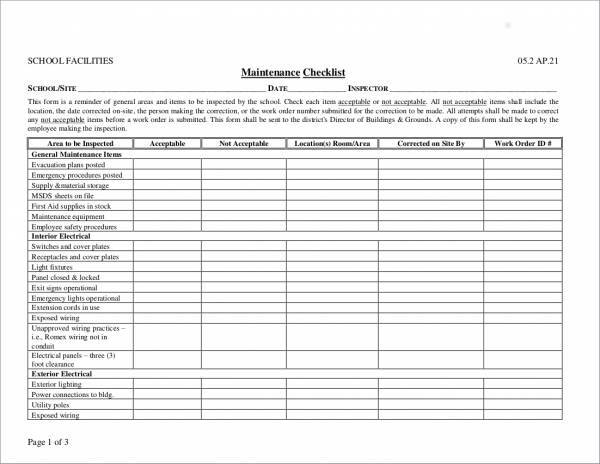 What Is a Seasonal Home Maintenance Checklist? 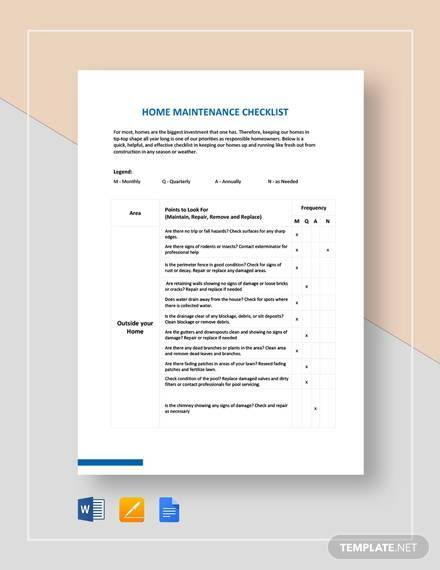 A seasonal home maintenance checklist is just like a preventive maintenance checklist, but instead of being used for machines and equipment, it is used specifically for maintaining homes during different seasons. Because there are four different seasons existing and being experienced by some of the states in the United States—namely winter, spring, summer and fall—it is no wonder why seasonal home maintenance is a must. 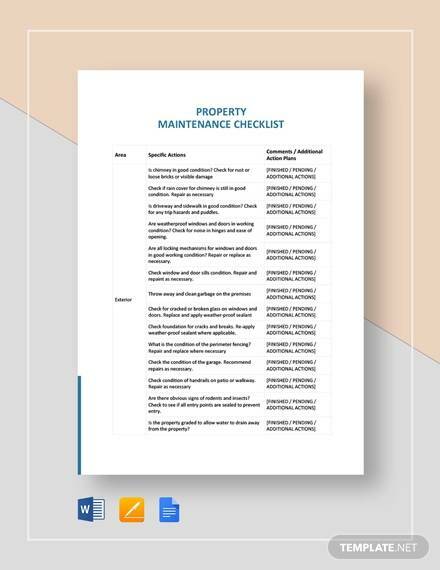 Different seasons need different home maintenance tasks and this is when seasonal home maintenance checklists come into use. There are different specific maintenance tasks to be done for each season and remembering them all is quite troublesome. Costly repairs can be avoided with the help of this checklist. It also helps in making sure that one’s home is safe and clean to live in. There are also other checklists that can be used to help maintain one’s home, like home inspection checklist and spring cleaning checklist. Why do you perform a home maintenance? Home maintenance is routinely done by homeowners to make sure that their homes are well maintained and kept safe from any damages and hazards. Doing routine maintenance allows them to determine possible problems and get them fixed before they become a full-blown problem. To help you quickly fix any maintenance problems you have at home, check out our maintenance tips below. Tip # 1: Check your electric connections at least once a month to ensure that they are well-grounded. Electric wiring and electric connections are often the cause of fires or power interruptions. Checking if your connection is properly grounded at least once a month prevents any future problems from occurring and helps detect any hazards brought about by faulty electric connections. Tip # 2: Clean the coils at the back of your refrigerator at least once a year. These coils could be at the back your refrigerator, which you seldom see unless you really check it out. Because you can’t always see it, cleaning these coils often seem unnecessary. Dust and all sorts of dirt clinging to the coils at the back of the refrigerator and could possibly cause a fire or make your refrigerator use more energy than it is supposed to. Vacuuming or cleaning the coils will keep your refrigerator in shape. Tip # 3: Do an annual check-up and cleaning of the fireplace chimney. During the winter or when the weather is cold, the fireplace chimney is lit up to keep a home warm. Chimneys are small and sometimes only little children can fit in, that is why cleaning it sometimes turns out to be a hassle. Even so, keeping your chimney clean can save you from a lot of health risks brought about by black smoke and soot. Tip # 4: Smoke detector batteries should be replaced every year. If you have battery-operated smoke detectors at home, it is best to have those batteries replaced at least once a year even if your alarms have never rung within that year. By doing so, you can make sure that your smoke detectors and fire alarm is charged and functional at any time, especially during fire emergencies. Tip # 5: Make sure to inspect the caulking of the doors and windows in your home. Who would want to freeze during winter, or who would want to get wet inside their homes during the rainy season? Not me. Making sure that the doors and windows in your home are caulked properly will keep you comfortable in your home all year round, no matter what kind of season. And don’t forget about checking the roof caulking, you don’t want to put buckets all around the place when it rains. Using the tips provided above will help you quickly fix any home maintenance problems that you have. Don’t live in your own home? Don’t worry as you can also use these tips to maintain your apartment, your room, and anywhere you can apply these tips. 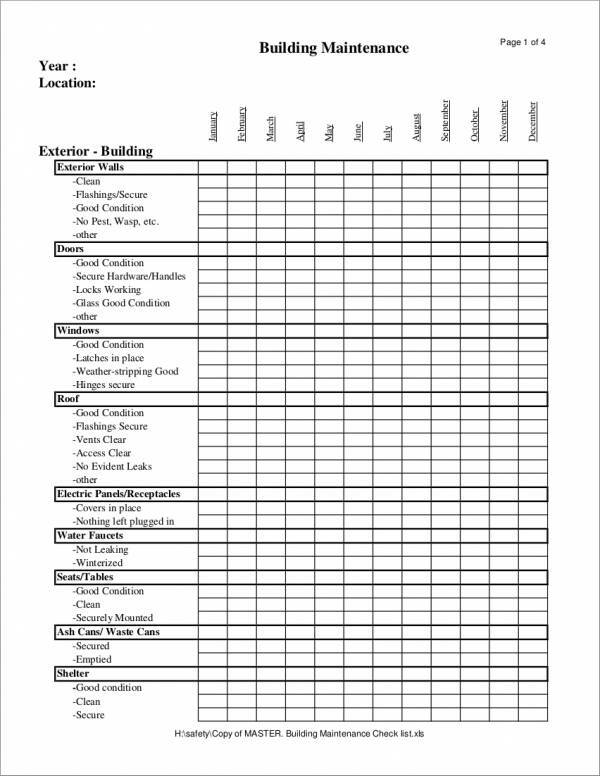 And to make things even easier and convenient for you, you can download and use our home inspection checklist. 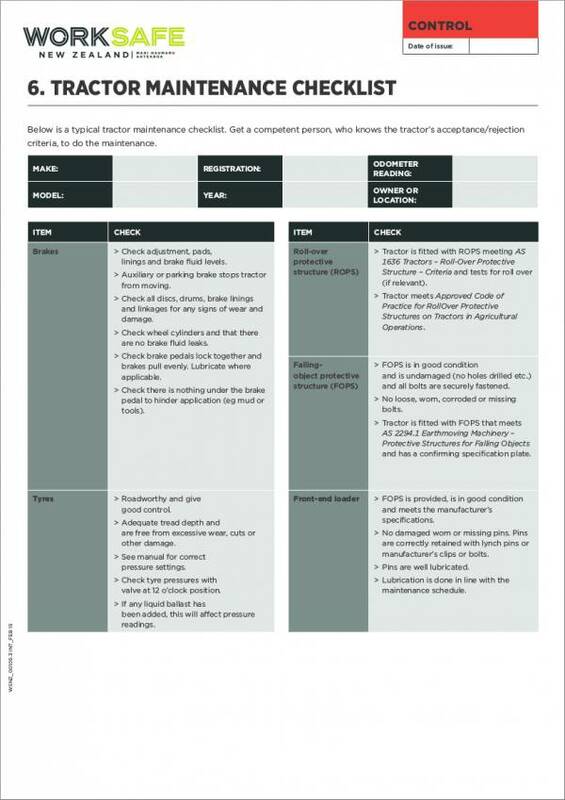 What Should Be Included in a Maintenance Checklist for Equipment? 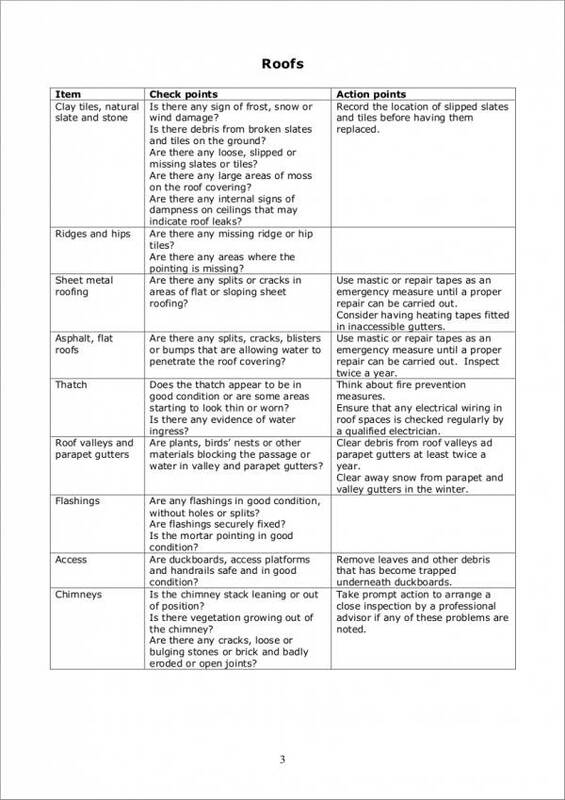 The things to be included in a maintenance checklist for equipment and machines largely depends on the type of equipment that needs to be maintained. 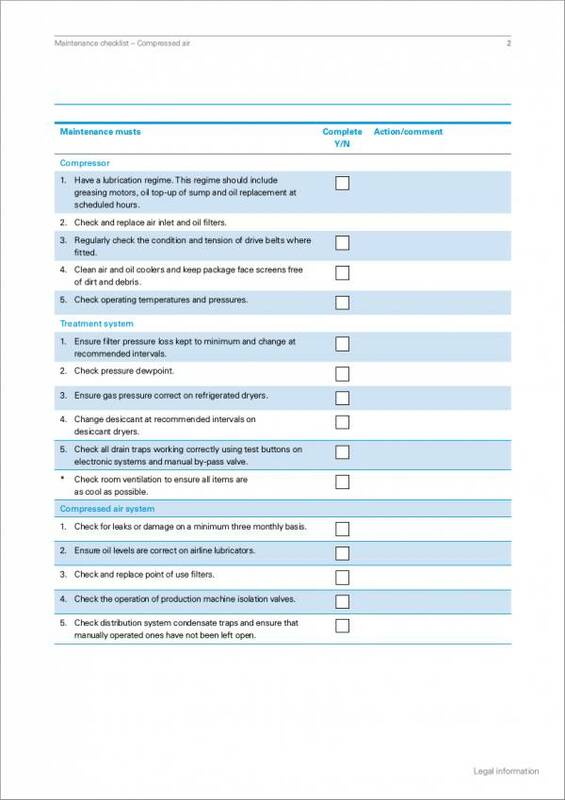 The maintenance checklist should be specific to the function of the machine to be maintained. This should be carefully taken into consideration to ensure that the maintenance being done is effective and does not cause further damage to the machine or equipment. The following are some general steps or activities that are commonly done during equipment maintenance. Perform pre-season check-ups. Equipment also need to be prepared so that they can withstand the extreme weather conditions during summer and winter. The changes in the season may damage and cause equipment to tarnish or break down. Pre-season check-ups can help prevent any damages from happening. 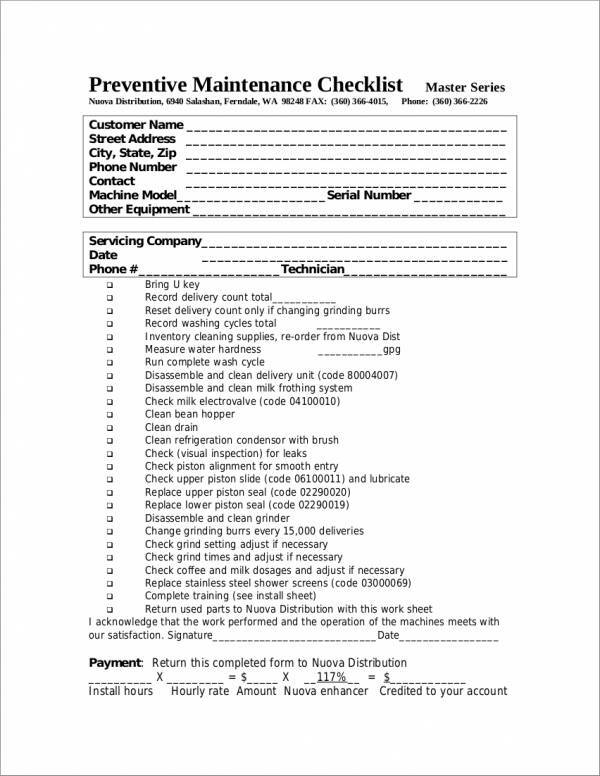 Check equipment or machine controls. Before using any equipment or machinery, it should always be checked to ensure that it is in good condition and safe to use. This helps prevents the occurrence of equipment or machine-related accidents. Make sure that all connections are tight. Loose connections can also cause accidents and damage to some essential parts of an equipment. Making sure that all connections are tight and secured in place is an important part of a maintenance checklist. Lubricate parts that need lubrication. Moving or movable equipment parts need to be lubricated as much as possible to avoid damage to their joints or bolts. This ensures that the equipment will function smoothly without any trouble. Check the temperature settings. The temperature of equipment or machinery should be maintained, preferably on their prescribed levels. If it becomes too hot or too cold, it might be unable to function or break down. Change air filters. Dirty equipment filters can damage the equipment as well as use up too much energy. Changing air filters should be regularly done and should be included in the maintenance checklist of most equipment. Clean the equipment or machine. Equipment maintenance is not only limited to the things mentioned above. Keeping the equipment or machinery clean is also important as this makes it look neat and effective. This is also one way of making a machine last for a very long time. 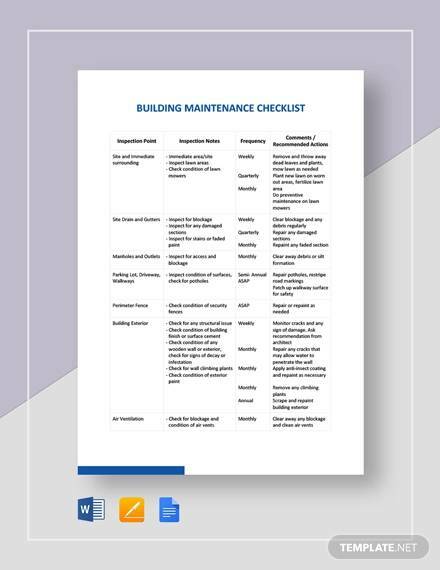 Choosing the appropriate maintenance checklist for the type of equipment or machinery is a must to ensure that the correct maintenance procedure is being done. 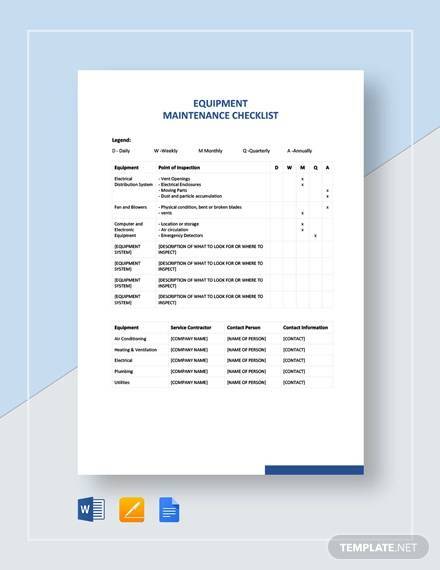 Sample maintenance checklist templates are available for you to download and use to make sure that you use the right maintenance checklist for the right equipment. Part of ensuring safety is doing maintenance. Because safety is a priority, it is very important that maintenance is done routinely to prevent predictable and avoidable accidents. This is exactly the reason why maintenance checklists come into existence and why it is important. 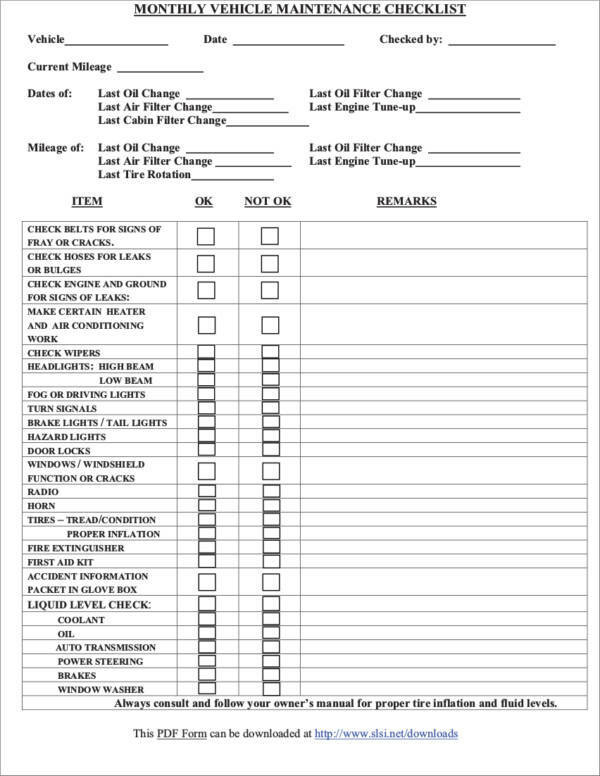 The importance of a maintenance checklist is listed below. 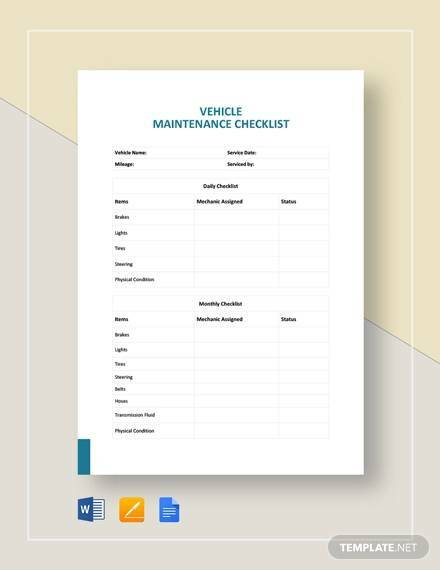 Maintenance checklists are important because it helps in identifying mechanical problems or equipment problems before they can even occur. 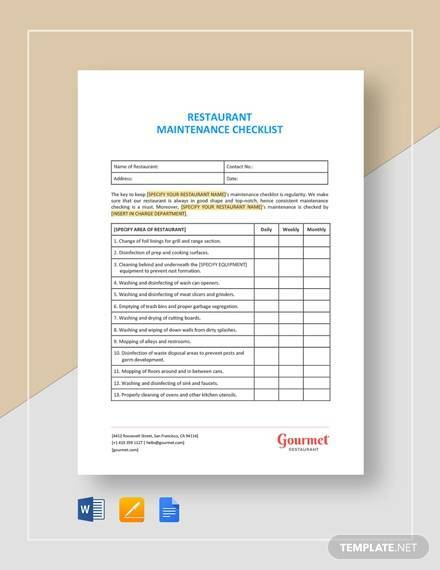 With the use of a maintenance checklist, the functionality of the machinery or equipment, or the safety of a certain place or location can be maintained. 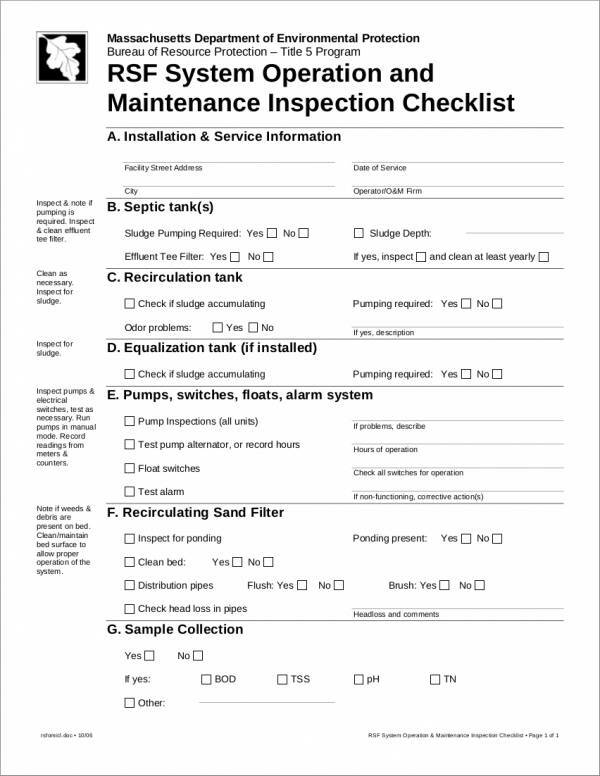 Maintenance checklists are important because it helps keep things and places safe at all times through early determination of possible problems and hazards. Through the use of a maintenance checklist, damages or breaks in a particular equipment or thing can be identified and repaired to prevent further damage and make sure that the machinery or equipment will be functioning at its best condition. It serves as a reminder for doing routine maintenance activities, like changing air filters, cleaning car seats, and lubricating moving parts of the equipment to name a few. 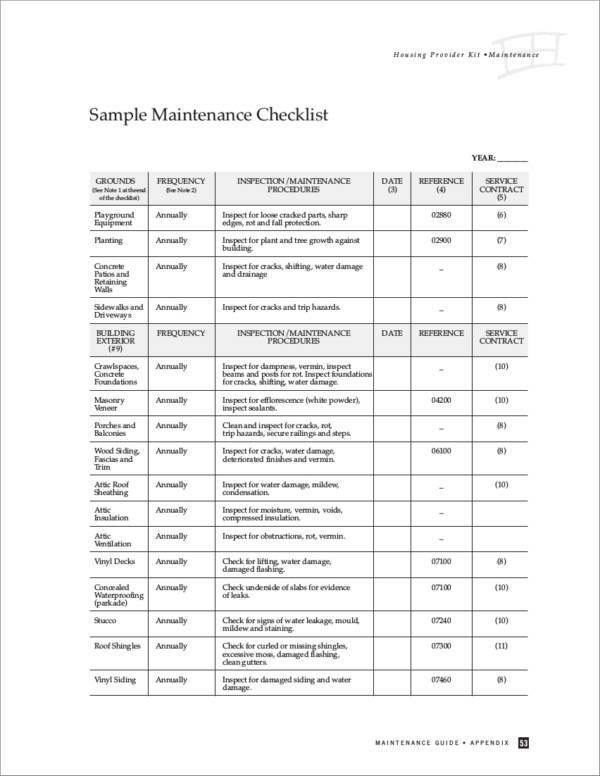 A maintenance checklist is important because it helps in pointing out which equipment are used more than the others. These equipment are more prone to becoming damaged, that is why more attention should be given to them. 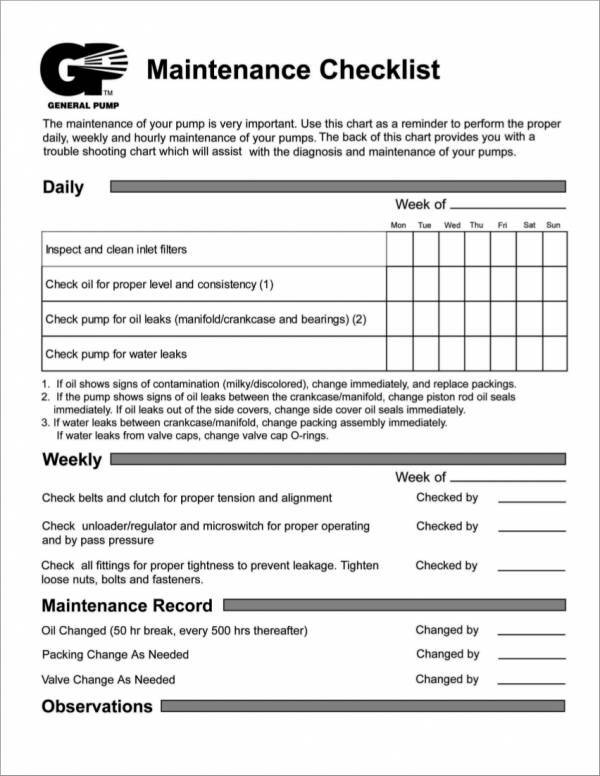 How important is a maintenance checklist for? 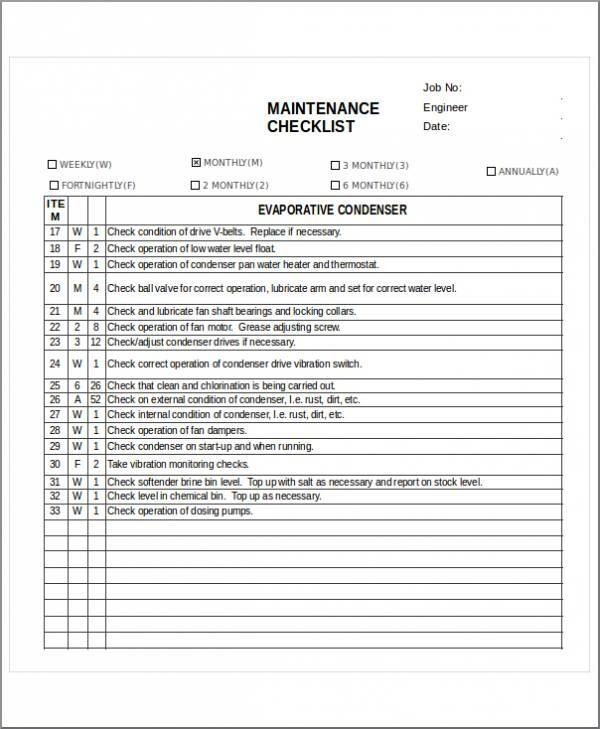 Maintenance checklists are certainly important without a doubt. 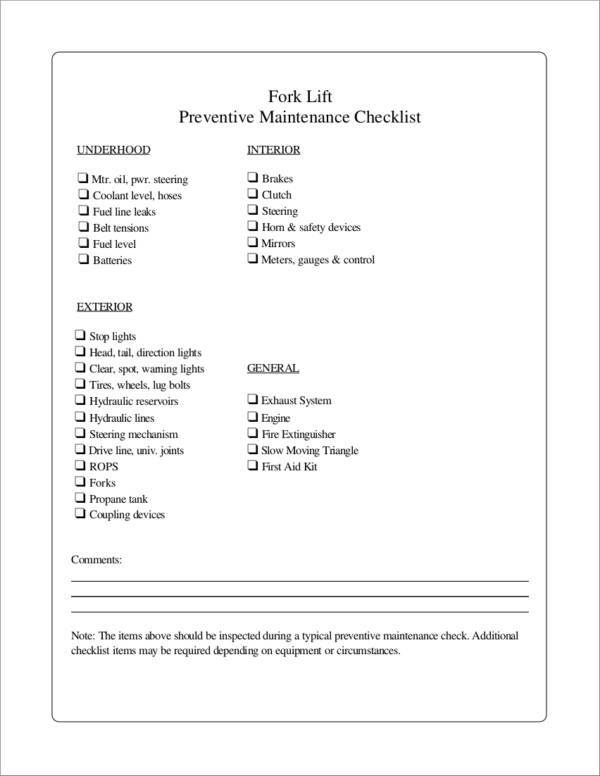 People who use such checklist are witness to how long they can keep their equipment or machinery in a good working condition. Well, these things don’t come cheap but taking care of it and doing the appropriate maintenance is surely budget-friendly.